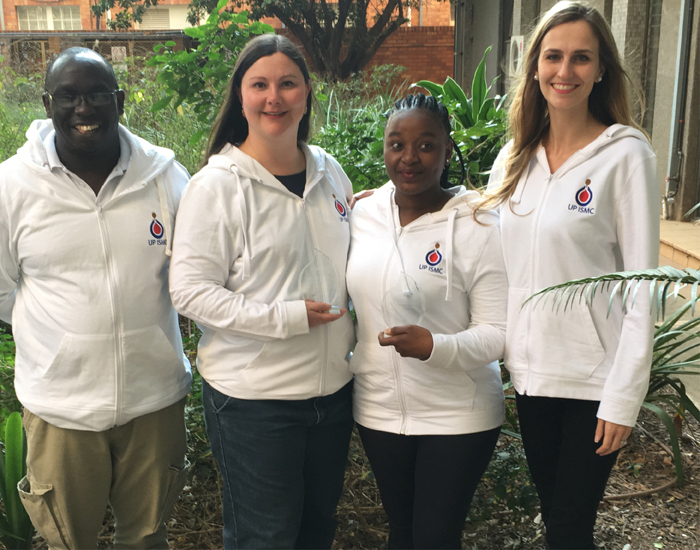 The University of Pretoria Institute for Sustainable Malaria Control (UP ISMC) researchers scooped awards at the recent Southern African Malaria Research Conference held at the National Institute for Communicable Diseases in Johannesburg. Hosted by the South African Medical Research Council, in collaboration with the South African National Department of Health and the Southern African Development Community (SADC) Secretariat, the theme of the conference was Malaria Elimination: A Moving Target. It created a platform for established and young emerging researchers to present their research and enable discussion on aspects surrounding malaria, and the challenges associated with malaria elimination in the SADC region. The award for best oral presentation went to Dr Jandeli Niemand, a Y-rated scientist and senior lecturer at the Division of Biochemistry in the Department of Biochemistry, Genetics and Microbiology. She is being groomed as the successor to Prof Lyn-Marie Birkholtz, the current incumbent to the South African Research Chair Initiative Chair in Sustainable Malaria Control. Dr Niemand’s talk, titled: Inducing controlled cell cycle arrest and re-entry during asexual blood stage development of malaria parasites, Plasmodium falciparum, was selected as the winner out of 39 oral presentations. Her work will soon be submitted for publication in an international journal. The award for best poster went to Takalani Makhanṱhisa, a first year master’s of science student from the Department of Zoology and Entomology. She was the 2017/2018 intern to the UP ISMC, and is a research assistant within the Institute. Her poster, titled: Effectiveness of selected cattle-administered endectocides to reduce malaria-vector mosquitoes, was selected the winner out of 38 posters. Earlier this year, Dr Phanankosi Moyo, a postdoctoral research fellow in the Division of Biochemistry in the Department of Biochemistry, Genetics and Microbiology was presented with the Brian Sharp Award for the best student presentation in the “Phytomedicines and Bio-prospection” thematic area at the 7th Multilateral Initiative on Malaria (MIM) Pan African Malaria Conference held in Dakar, Senegal. His presentation, titled Natural products as potent and pan-reactive antimalarial agents: discovery, isolation and biochemical characterisation communicated findings of his PhD studies. As part of his postdoctoral work, he continues with research inclined towards investigation of plants in search of novel malaria transmission-blocking agents, to provide new tools to contribute towards achieving the goal of malaria elimination and ultimately, eradication. He also received a competitive travel grant, from the MIM Local Organising Committee, to attend the conference. Dr Bianca Brider, a young postdoctoral researcher in the UP ISMC’s parasite cluster was awarded a speaking opportunity at the 68th Lindau Nobel Laureate Meeting in Lindau, Germany. She was selected as one of three young international scientists to present a talk on her research at the Master Class, titled The killer defence: Infection and Cancer. The Master Classes are designed to allow young scientists the unique chance to profoundly discuss four diverse Master Classes during the duration of the meeting, each with three young scientist speakers and two Nobel Laureates. Dr Brider was one of 12 selected speakers out of over 180 young scientists who applied for the Master Classes. She was the only young scientist speaker from Africa. Prof Tiaan de Jager, Director of the UP ISMC, said he is “proud of the work being done by the Institute’s young researchers. They are contributing greatly to the South African and global malaria elimination agenda”.